We are located at 6 Boundary Avenue in Thurmont, Maryland. 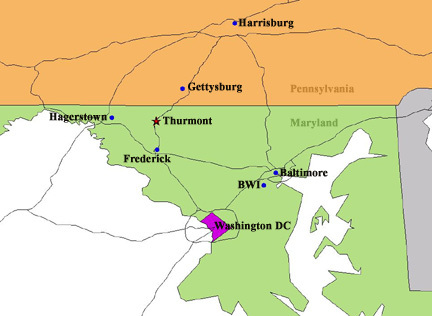 Thurmont is situated along the eastern edge of the Catoctin Mountains and is approximately 50 Miles from the Baltimore and Washington Beltways and 16 miles north of Frederick, Maryland. bridge and make the first left (Boundary Avenue). Parking is available from the intersection to along the front of both buildings. left (Boundary Avenue). Our buildings are the first commercial buildings on the right.